This all started when a friend told me about Mulled Wine Sorbet. I dreamt about it for the next two days and promptly decided I needed to make it. 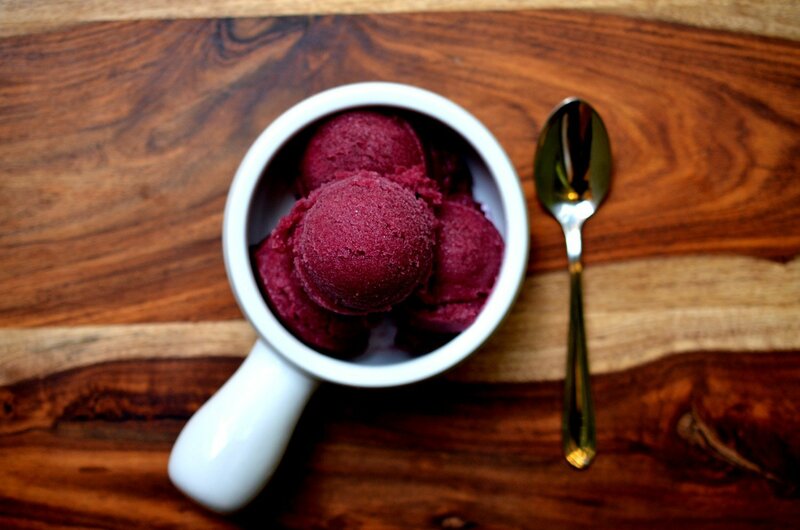 I thought that if I knew how to make Mulled Wine, then I could make Mulled Wine Sorbet. It couldn’t be that hard, right? The result was better than I could have imagined and an absolute crowd favourite (I have already have multiple requests for the recipe) – and I’ve even been told it is better than the store-bought version! In a large saucepan over medium heat, combine the red wine, cinnamon sticks, anise seed, cloves, nutmeg, water and sugar. Slice the lemons and orange in half. Juice the fruit over the wine mixture and add the rinds to the saucepan. Slice the vanilla bean lengthwise. Using the back of the knife, remove the seeds from the bean. Add the seeds and bean to the wine mixture. Bring the mixture to a boil for about 10 mins. Remove from the heat and let cool. Pour into a fine mesh sieve lined with cheesecloth over a large bowl. Let the bowl cool to room temperature and place in the fridge for a minimum of 12 hours. Cool your ice cream maker to manufacturers instructions. Pour cooled wine mixture into the ice cream maker and let turn on until sorbet is thick. If a thicker consistency is desired, place in the freezer until desired consistency is reached. If you do not own a ice cream maker, place in a large glass baking pan. Place level in your freezer. Stir the mixture often during the freezing process to ensure that large ice crystals do not form. The more frozen the sorbet becomes, the less stirring it will require. This can be made ahead and kept frozen. Honestly, it was wayyyyyy better than the store bought version! Way to go Lindsay!